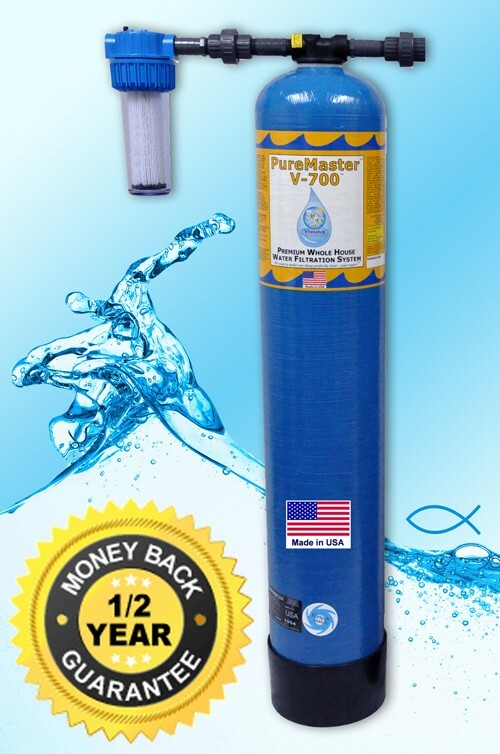 The PureMaster™ V-Series™ V-700™ Premium Whole House Water Filtration System effectively performs for about 700,000 gallons or 7–10 years of use for the average household and is loaded with approximately 60 pounds of NSF® certified high-grade water filtration media. The PureMaster V-700 effectively filters chlorine, chloramine/chloramines, sediment and particulate, cysts, copepods, VOCs, SOCs, THMs, PAHs, atrazine, benzene, xylene, pesticides, insecticides, herbicides, tastes, odors and hundreds of other potential contaminants and harmful chemicals from the water entering your business or home. The PureMaster™ V-700™ Whole Home Unit (or drinking water system) is designed for maximum contact time to ensure optimum filtration for about 700,000 gallons of water or 7–10 years of use for an average household). The PureMaster V-700 is a Point-of-Entry (POE) system designed for municipally treated water, but may also be used, in many cases, as a well water filter or treatment system. The PureMaster V-700 may serve as a mild water softener, depending on your specific water conditions, or, it may also be installed after a water softener. The PureMaster™ V-700™ system uses an advanced multistage filtration process, ensuring maximum contact time, through NSF® certified high grade water filtration media which is specially blended and layered. SUMMARY: The PureMaster contains significantly more carbon media and a better pre-filter than most of our competitors, providing cleaner and purer water. The Vitasalus PureMaster V-300, V-500 & V-700 Premium Whole House Water Filtration Systems effectively filter chlorine, chloramines, sediment & particulate, cysts, copepods, VOCs, SOCs, THMs, PAHs, atrazine, benzene, xylene, pesticides, insecticides, herbicides, tastes, odors and hundreds of other potential contaminants and harmful chemicals. Don't settle for less; get a PureMaster today for you and your loved ones! Have any questions, need help deciding or ordering? Call us anytime 24/7 at 1-877-284-5042. Vitasalus PureMaster V-700 vs. Aquasana EQ-1000 ? The PureMaster V-700 (about 5 feet tall and 10" in diameter) has approx. 2 cubic feet of high-grade, small-granule catalytic activated coconut shell and medium-granule activated coconut shell carbon compared to Aquasana's EQ-1000 (about 4 feet tall and 8" in diameter) which has approx. 0.5 cubic feet of high-grade activated carbon. Since the EQ-1000 does NOT use catalytic activated carbon, its activated carbon will NOT be effective at addressing chloramines. Therefore, since the PureMaster has more high-grade carbon media inside its tank, it will filter more contaminants out of the water and outperform Aquasana's EQ-1000. For this reason, you will not see the Vitasalus PureMaster shown on the waterfiltercomparisons.com website (owned and maintained by Aquasana, Inc.). Vitasalus PureMaster V-700 vs. Pelican PC1000 ? The PureMaster V-700 (about 5 feet tall and 10" in diameter) has approx. 2 cubic feet of high-grade, small-granule catalytic, activated coconut shell and medium-granule activated coconut shell carbon compared to Pelican's PC1000 (about 5 feet tall and 10" in diameter) which has approx. 1 cubic foot blend of high-grade coconut shell based activated carbon and catalytic coconut shell based activated carbon. Therefore, since the PureMaster has more high-grade carbon media inside its tank, it will filter more contaminants out of the water and outperform Pelican's PC1000. For this reason, you will not see the Vitasalus PureMaster shown on the comparehomewaterfilter.com website (owned and maintained by Enviro Water Solutions, which also does business as WaterFilter USA and pelicanwater.com, distributors of the Pelican). In general, compared to most of our competitors, our PureMaster V-700 contains 2 to 4 times more water filtration media, which means that our customers may enjoy even cleaner, better tasting and healthier water at every tap. Beware of companies that withhold a lot of details about their systems upfront. Aquasana is a trademark owned by Aquasana, Inc.
Pelican is a trademark owned by Enviro Water Solutions, Inc.
Vitasalus, PureMaster, V-300, V-500 and V-700 are trademarks owned by Vitasalus, Inc. This deluxe high capacity system for both residential and light commercial applications provides the most affordable and highest capacity of any Whole House Water Filtration System in America! The Vitasalus/Equinox Products PureMaster™ V-Series™ Systems easily offer the most comprehensive and affordable home and business water filtration solutions available today! Complete System: Includes the Ready-To-Install PureMaster™ V-700™ System (blue tank unit) plus an installation kit which includes a 0.35-micron prefilter used to filter out potential copepods, cysts, sediment and/or particulate matter down to 0.35 microns in size. Replacement System: Includes only the Ready-To-Install PureMaster™ V-700™ blue tank unit with filtration media and inlet and outlet head. NOTE: The replacement system option is typically for existing V-700 owners, or owners of the 3 yr./300,000 gal. or 5 yr./400,000 gal. Equinox Premium whole house water filtration systems that utilize two (2) blue tanks vertically stacked. Replacement Media: Includes only the PureMaster™ V-Series™ filtration media necessary for the different stages within the V-700's blue tank unit, and a filter media filling/ refilling funnel. NOTE: This Replacement Media option is for existing V-700 system owners. effectively performs for about 700,000 gallons or 7–10 years of use for the average household and is loaded with approximately 60 pounds of NSF® certified high grade water filtration media. provides clear, healthy, drinking-quality water throughout your entire business or home including all showers, sinks, bathtubs, washing machines, dishwashers, and refrigerators. effectively filters chlorine, chloramine/chloramines, sediment and particulate, cysts, copepods, VOCs, SOCs, THMs, PAHs, atrazine, benzene, xylene, pesticides, insecticides, herbicides, tastes, odors and hundreds of other potential contaminants and harmful chemicals from the water entering your business or home. utilizes an advanced 3-stage filtration process leveraging our advanced EvenFlow-MaxContact™ process. View our 3 filtration stages. utilizes high grade NSF® certified water filtration media, tank, and components/parts/materials. is designed for Residential or Light Commercial applications. requires no electricity, backwashing or backflushing. provides better-than-bottled water quality throughout your home or business for about 50¢/day, or well under 1 penny/gallon. 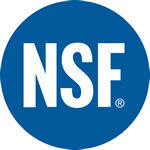 is a premium quality system constructed with proprietary, multi-layered NSF® certified media. has a Lifetime Pro-rata Warranty. has a 6-month 100% Satisfaction Guarantee, allowing you to buy with complete confidence! along with other V-Series Systems is so advanced, effective and affordable, there is nothing out there that even compares"...this is why we are literally "off the charts!" is the highest quality and most affordable system available anywhere in the world! allows for fast and easy installation without contracting a professional plumber. or (Outside USA) +1 (248) 585-8815 for a FREE Phone Consultation, or contact us via email and communicate your specific water condition(s) with one of our Water Filtration / Treatment Specialists so that we may immediately provide you with straightforward answers and high quality affordable options to fully and properly address your specific water conditions. Designed for maximum contact time to ensure optimum drinking water filtration for the average household of 300,000 gallons or 3–5 years for the V-300; 500,000 gallons or 5–7 years for the V-500; and 700,000 gallons or 7–10 years for the V-700. We also guarantee 100% customer satisfaction with our industry-leading, 100% satisfaction-guaranteed warranty including: 7-Year pro-rated warranty; plus a 1-Year Defect-free warranty on materials and workmanship. Specialized design with advanced media blending provide unparalleled water filtration capabilities which effectively filter chlorine, chloramine/chloramines, sediment and/or particulate matter, cysts, copepods, Volatile Organic Compounds (VOCs), Synthetic Organic Compounds (SOCs), THMs (chlorine by-product), PAHs (Chloramine by-product), atrazine, benzene, xylene, pesticides, insecticides, herbicides, tastes, odors and hundreds of other potential contaminants and harmful chemicals from the water entering your home. Shipped Pre-Assembled (tank comes pre-loaded with special media) and Ready-To-Install, which greatly simplifies the installation process and significantly reduces installation time and cost. Standard system accommodates both 3/4" (standard) and 1" plumbing. 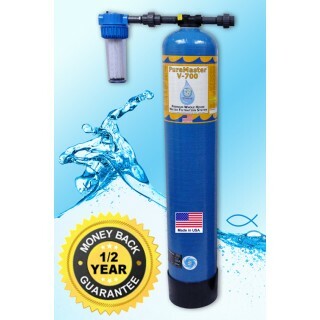 Effective for both residential or light commercial water filtration applications. Requires minimal installation space, typically an area approximately 5-feet high by 3-feet wide by 1-foot deep. Removes COPEPODS (100% copepod/copepods removal)—which may be present in your source water—via the system's 0.35-micron (sub 1-micron) prefilter. Removes cysts which may be present in your source water via the system's 0.35-micron (sub 1-micron) prefilter. No backwashing or backwashing drain required. Extends life of your plumbing fixtures and appliances. You and your family can have clear, healthy, filtered water throughout the entire house for about 50¢/day! 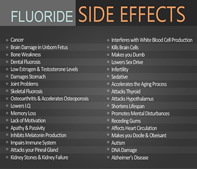 Because of the many known health risks of the fluoride in your water supply, you may also wish to get our highly-specialized FluorideMaster™ Whole House Fluoride Filtration System along with the PureMaster™ V-700. 3 years later, Review by Stephen D.
Smooth, tasty and gentle! I Love it! !, Review by Jasmine K.
Highly recommend it!, Review by Ted S.
Completely Satisfied with PureMaster V-700 Beyond My Expectations, Review by Mark P.
An excellent filter! , Review by Jacob W. Excellent!, Review by Joseph J. Arrived on time, Review by Joseph O.